Whilst I may be a vegetarian, I’ve certainly never claimed to be a *healthy* vegetarian. Its actually surprisingly easy to have an unhealthy diet, such as too much sugar or junk food to counteract the lack of unhealthy fatty meat-based meals. NZ has an abundance of “Fish and Chip” shops, typically serving a whole range of deep fried meals, but often Chinese or other Asian takeaways, depending on the family’s speciality. When I get a deep fried craving, selection can sometimes be limited – a lot of the vegetarian options are limited to chips, something fritters or vege/spring rolls – often these aren’t particularly nice either, too many of the shops use very battery fritters which don’t appeal. About a year ago I was introduced to a great takeaways on Bond St, in the middle of Wellington’s CBD called “Fisherman’s Plate” – it’s a rather tatty old shop, but is always pretty busy and do some great deepfried meals. It’s also a nice change to have (what I think may be homemade) chips cooked fresh, at least they are certainly different to the all-too-common deep frozen McCains fare that many of the shops are now serving. Other than deepfried (un)goodness, they started offering a number of Asian meals several months ago which seem to be very popular, although I haven’t tried them myself (mostly meat-based from what I’ve seen). 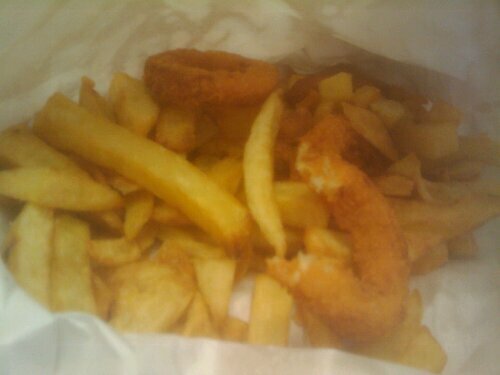 This entry was posted in Uncategorized and tagged deep fried, fish and chips, food, opinions, vegetarian, wellington. Bookmark the permalink.